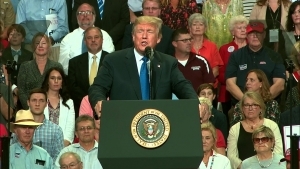 (WBAP/KLIF) – President Donald Trump’s rally with Senator Ted Cruz has been moved but is still staying in Houston. The rally had been scheduled Monday night for an arena only holding 8,000 people but has been moved to the much bigger Toyota Center holding 18,000. Politico reports the Trump campaign made the decision Thursday. Cruz is locked in a tight race with Congressman Beto O’Rourke but is leading in all polling. You can hear the rally live Monday night here on WBAP and KLIF.